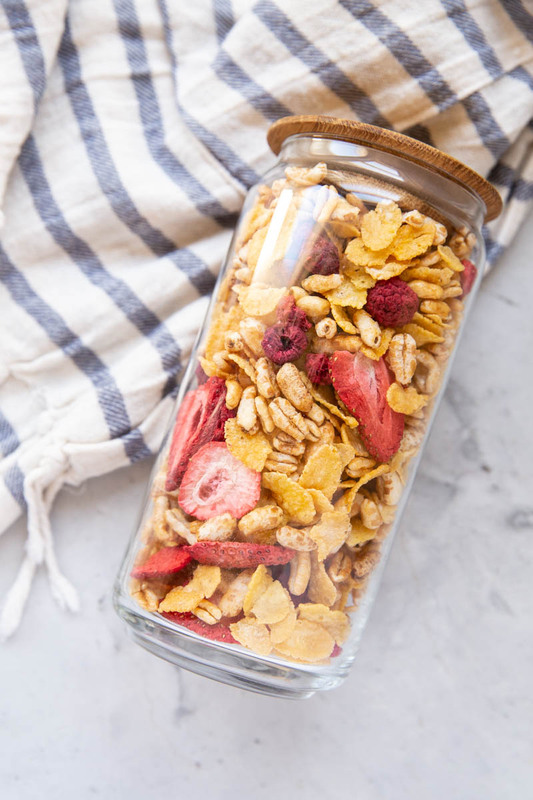 This Homemade Cereal Recipe with puffed kamut, cornflakes and freeze dried berries is a new staple for quick breakfasts. Weekday mornings must be simple and streamlined at our house. A bowl of cereal has become a new standby, just as it was when I grew up. During our travels I discovered that my kids complain less when we have a routine for breakfast. They will be less likely to fight about what were eating in those early hours if they already know our breakfast routine. We got into a habit of eating muesli and yogurt, especially while we were in France, so that’s what they came to expect on weekday mornings. 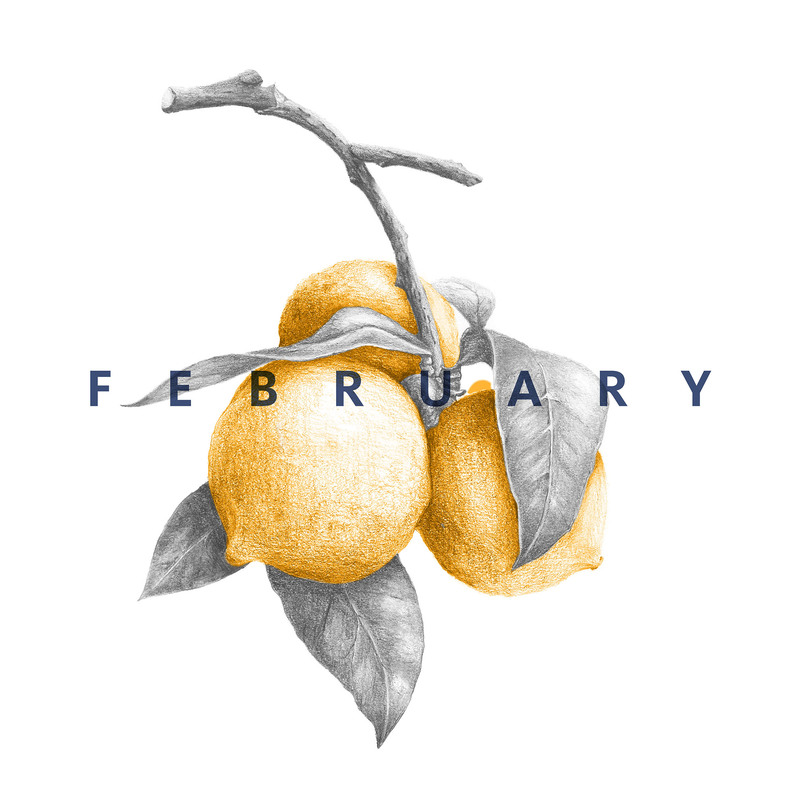 On weekends, we would splurge and have pastries or go sit at a cafe for a special meal but weekdays had their system and it was a working one. As we transitioned from France to Italy, our muesli tradition also had to change. Museli in Italy was harder to come by and the cereal isle was more like a few boxes of imported sweet cereals. So, when I spotted a locally made cereal that was also sugar-free I threw several bags into my basket to try. My kids loved that cereal so much so that I knew I had to recreate it when we got home. This cereal is a straight copy of that special bag I found at the markets. I don’t know about you but I grew up on cereal. And I’m not talking the healthy stuff, but the sweet cinnamon and sugar coated kind. Now, it’s still a familiar treat for me. Until now I hadn’t really fed my kids much cereal. Occasionally, we’d buy a box or two but most of them don’t keep my kids full until lunch time. 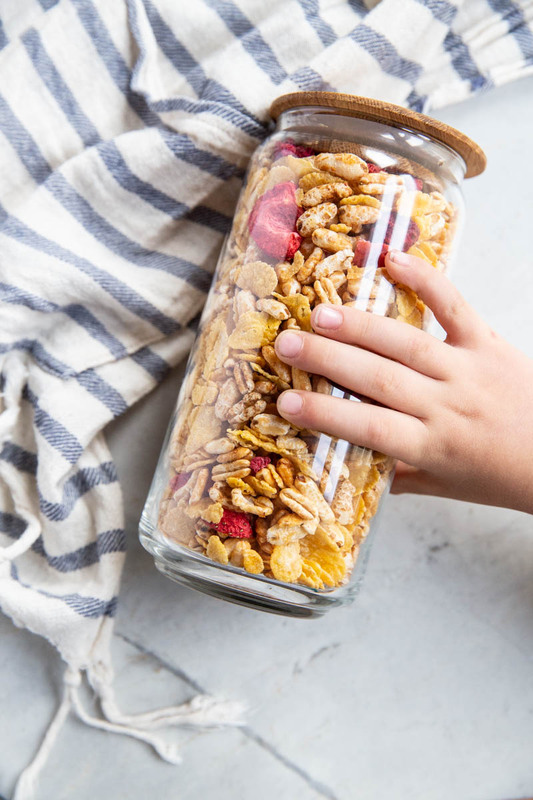 When we serve this with almond milk or yogurt and some extra fresh berries its more filling and way less sugar-y than what you find on the shelves… but still so fun and satisfying for those cereal cravings. AND it’s super EASY to make and super CHEAP compared to a box of anything comparable. Making homemade cereal, may sound hard, like, ‘don’t I need some special equipment for this? 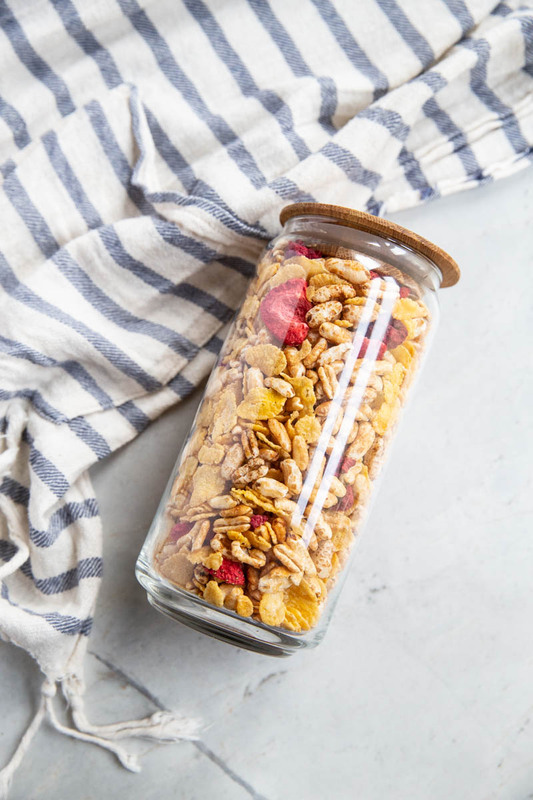 ?’ But it’s really easy if you just start with simple ingredients like organic cornflakes (check the label for a brand with few ingredients) and puffed kamut (you can buy a huge bag of this at most health food stores). 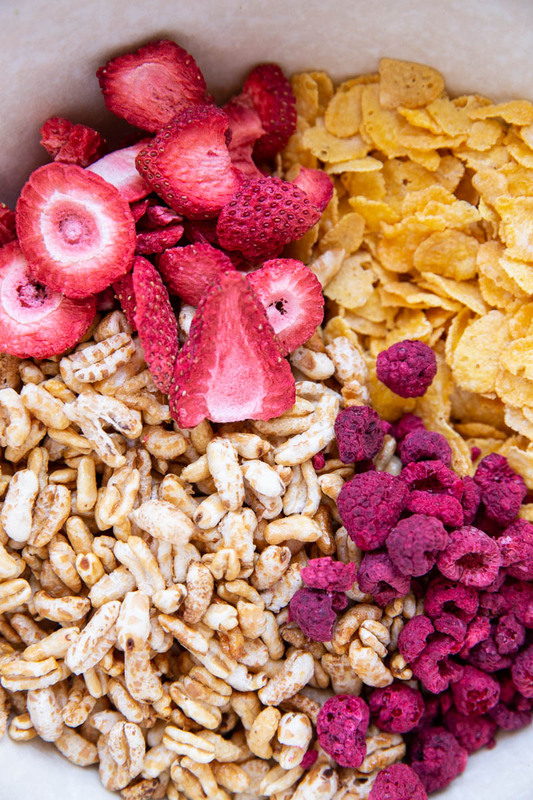 Then all you have to do is mix the ingredients together for your homemade cereal blend. I like to toast my kamut with a little honey and oil just to lightly sweeten and crisp it up but if you’re low on time just mix it in without adding the honey and toasting. Kamut is an ancient-grain relative to durham wheat and is more easily digestible than other grains. While kamut is lower in gluten than many other grains it is still not gluten free. 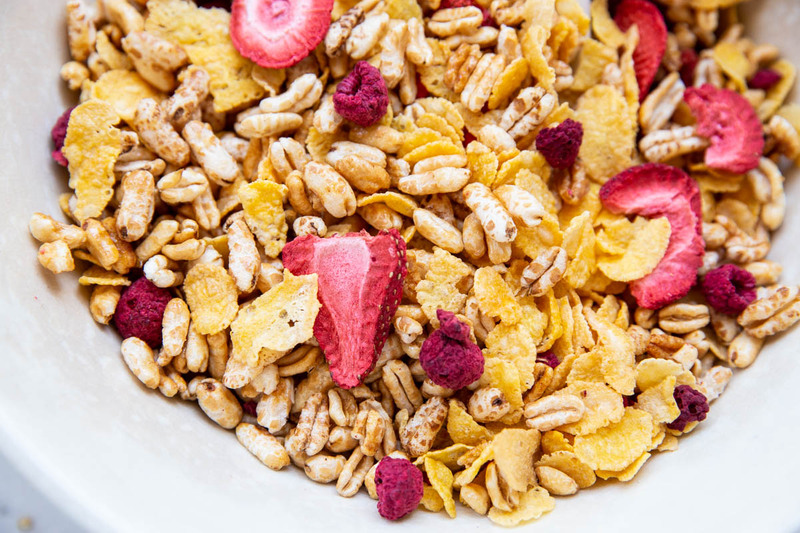 So, if you’re looking for a full gluten-free cereal blend then try using a puffed brown rice. 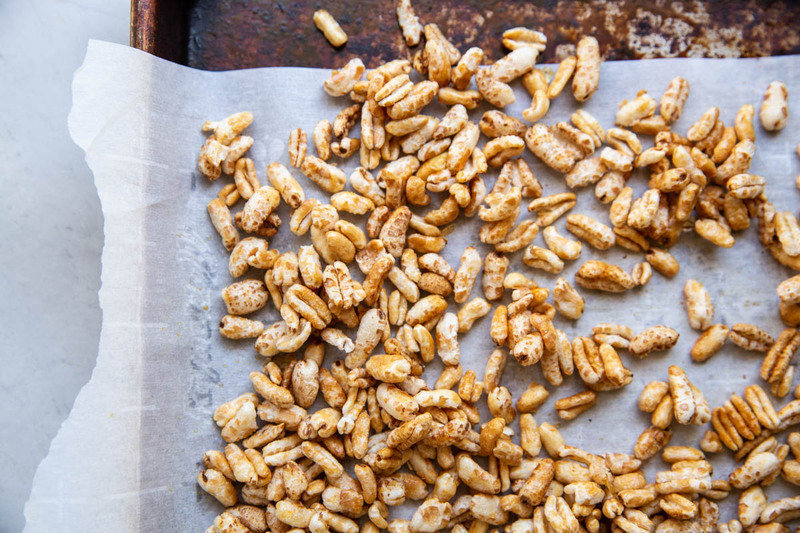 If you remember the cereal Honey Smacks then you’re familiar with puffed kamut already. Feel free to get creative with this! I’d love to see your own blends and creations so tag #vintagemixerrecipe on Instagram to share! 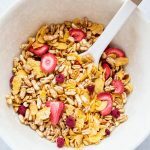 Here's a great homemade cereal recipe that is low carb and sugar-free. It makes a large quantity and is way cheaper than what you find at the stores. Preheat the oven to 325 degrees and line a baking sheet with parchment. In a small pot heat up the oil, honey, and salt just until they are warm and combined. In a large bowl mix together the puffed kamut with the oil and honey then spread out on the parchment lined baking sheet. Bake for 10 minutes then lightly stir and continue toasting for 4 more minutes (14 minutes total). Let the kamut cool then mix with the rest of the ingredients. Store in an airtight container at room temperature. 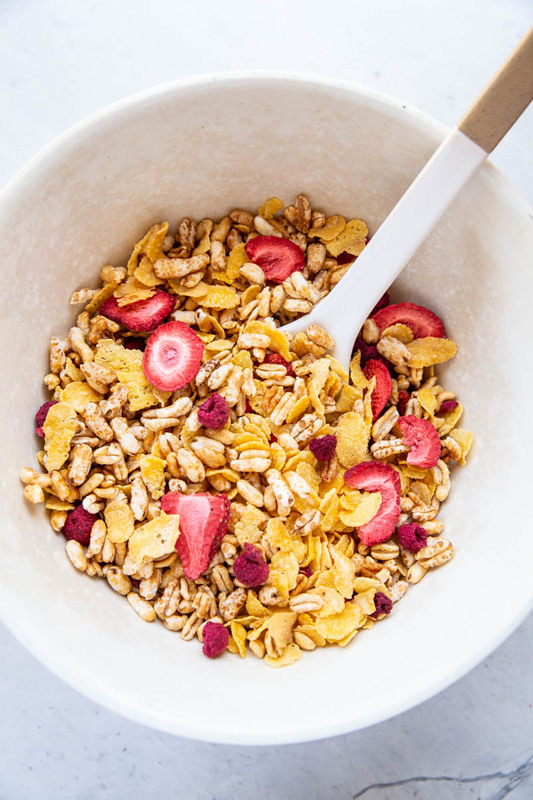 Serve cereal with your preferred milk or yogurt. You can find puffed kamut at most health food stores on the cereal isle but in a large bag. For the oil in this recipe you can use sunflower oil, avocado oil, or organic canola oil. I love this sugar free mix! Great idea! Becky this is so smart, and looks incredibly easy too. And likely a whole lot more wholesome. 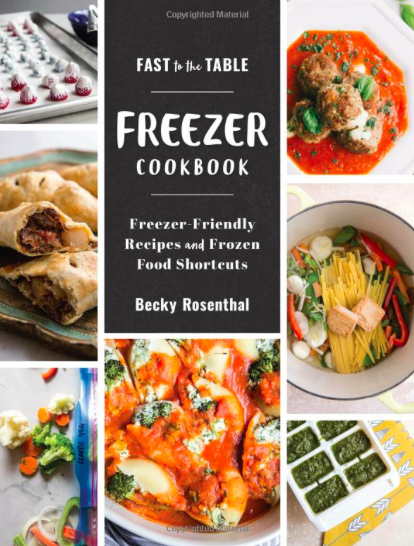 Where do you get the freeze-dried berries from? Good question… I should have put that in here. They have them at Whole Foods and trader joes!